The friendliest trail race ever! Earlier this year after a long recovery from an ultra trail I had run in April last year I decided it was time to hit the trails again. Apart from the fact I am lucky enough to live in the mountains nearby the trail running ‘mecca’ of Chamonix, Mont Blanc. I love the variety in both terrain and scenery as well as the uncertainty that trail running brings to the table. The fact that a slow plodder (like myself) can complete these seemingly crazy races with large positive ascents and longer than average distances with just determination alone (well maybe a strong pain threshold too!) with just a bit of training i find astounding. With this in mind I started to think about some of the races I would like to do this year, a tough decision when living in the Alps as you are spoilt for choice! One such race I had seen in passing was the Gran Trail Courmayeur, but in all honesty I didn’t think much of it until having an aperitif (or two) with a likeminded gaggle of friends. They were raving about the Gran Trail Courmayeur and how they loved it last year. So much so that they had already entered again this year. The race sounded awesome with lots of character, spectacular scenery and great atmosphere and I wanted to be a part of it. Their enthusiasm was infectious so I checked the dates and signed up that very evening…albeit for the shortest distance of 30 km. My race preparation did not get off to the best of starts mainly due to my last minute planning. I realised quite late in the day that bib collection was the evening before the race or before 5:30am on the day. With my race starting at a typically laid back Italien time of 11am this was a bit of a problem, and I soon realised why all my fellow competitors opted to make a weekend of it, arriving Friday and staying til Sunday. Courmayeur being the other side of the Mont Blanc Tunnel made this challenging for me, especially when there was a 90 minute queue to get through all evening. Despite the set bib collection times I contacted the race organiser late Friday evening, who very kindly replied and organised for me to collect my bib on race day at a much more reasonable time of 9:30am, perfect! As I arrived in Italy, it lived up to all expectation; magical weather with pristine blue skies and the sun shining unrestricted above us. However this is not necessarily what you want with a 11am race start, it was HOT! I got to Courmayeur to be greeted with a warm welcome, friendly volunteers and jovial competitors. The town was buzzing with excitement and a family friendly atmosphere with lots of activities and events going on simultaneously. Runners started collecting at the start line with 10-15 minutes to go, all in good spirits, laughing and joking away. The countdown started cinque, quattro, tre, due, uno and then we were off. Winding through the beautiful cobbled streets of Courmayeur this section was pretty crowded to begin with but things started to thin out once we hit the trail and it became single file. The trail up to the Bertone Refuge was a relentless collection of climbing zigzags in the full blaring heat of the sun. It was a relief to get to the refuge where the first aid station was located to fill up on fuel and fluid but most of all the get the pleasant breeze. The aid stations are wonderfully European full of savory breads, cheeses and cured meats. Plus the sweet dark chocolate, cake, orange slices, bananas and other dried fruit. Coke, electrolyte drinks and water were the fluid options on offer also. What was to follow in my opinion made the race. The truly stunning scenery through the gorgeous alpine valley of the Val Ferret Balcony. 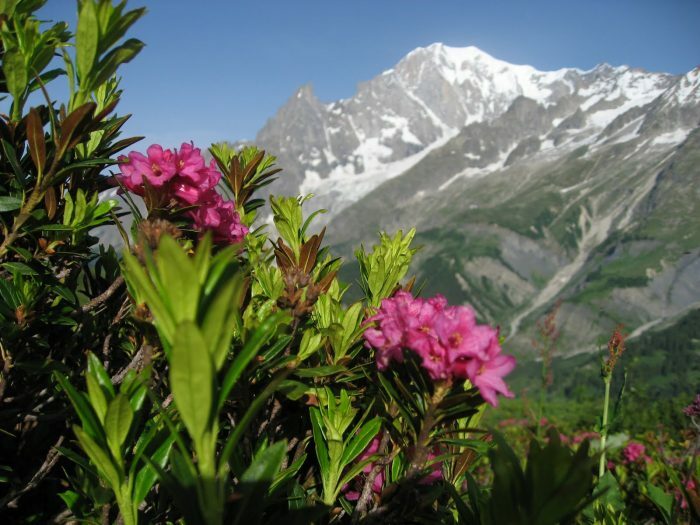 The Mont Blanc massif on your left, alpine flowers scattered amongst the green alpine pastures and the alluring single track undulating trail beneath your feet. Next stop was the Bonatti Refuge were many supporters, friends and family were waiting (around the mid way point) to cheer competitors on. With a quick fuel stop, a refreshing drink and a hug with friends and family it was time for the next big climb. Although the surrounds were stunning it seemed most of the runners were starting to hurt a little at this point (or that could be just me) and getting their heads down to reach the Col du Sapin before taking on the unrelenting steep technical descent on loose scree rocks. One more short kick up to the final aid station and then its a 4 km traverse to La Suche where a fantastic pano of Courmayeur can be seen. With the finish line in sight, but still 4km away you take comfort in that it’s all downhill from here to Courmayeur. You can hear the finish line before you actually see it but the party does not stop there. Upon crossing the finish line to roaring cheers, loud music and a medal you can take full advantage of the free pasta and beer on offer. Here again was where my inexperience of the GTC kicked in, whilst many of my fellow competitors continued to celebrate and gorge on the delicious italian cuisine and plentiful supply of vino. I on the other hand reluctantly headed back to the comfort of my own home. With celebrations continuing into Sunday… including the prize giving ceremony BBQ. I would definitely recommend staying for the entire weekend! But be sure to book your accommodation early as the best accommodation gets booked up quickly. One of the main things I took away from the GTC was how friendly and incredibly supportive the crowds and particular the organisers and volunteers were. There was no task too big or competitor to small to deal with before, during and after the event. All in all I think a very successful fourth edition of the Gran Trail Courmayeur and the accompanying feast that will undoubtedly keep me coming back for more year on year. Having experienced the Gran Trail Courmayeur… im going to say festival. I will definitely be making a weekend of the event and booking into one of the many beautiful hotels and sublime luxury spas nearby next year. To find out more about the Gran Trail Courmayeur and their various races make sure you check out their website here or join their Facebook page. Hopefully we will see you on the trail for next year’s Gran Trail Courmayeur on the 8th-9th July 2017. If you require airport of in resort transfers to Courmayeur why not check out our reliable, low-cost private transfer service? You can get a a quick quote on our website here or take a look at our Courmayeur Summer Guide.